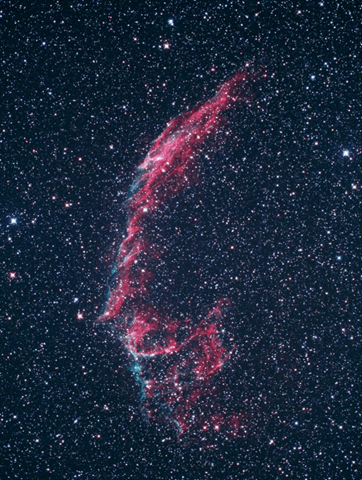 Tons of Messiers were knocked out, and now I’m ready to apply for the Messier certificate from the Astronomical League. That’s 31 new Messier objects, bringing my total up to 98 out of 110. The remaining 12 will have to wait until the dead of Winter and one or two left until Summer of 2009. 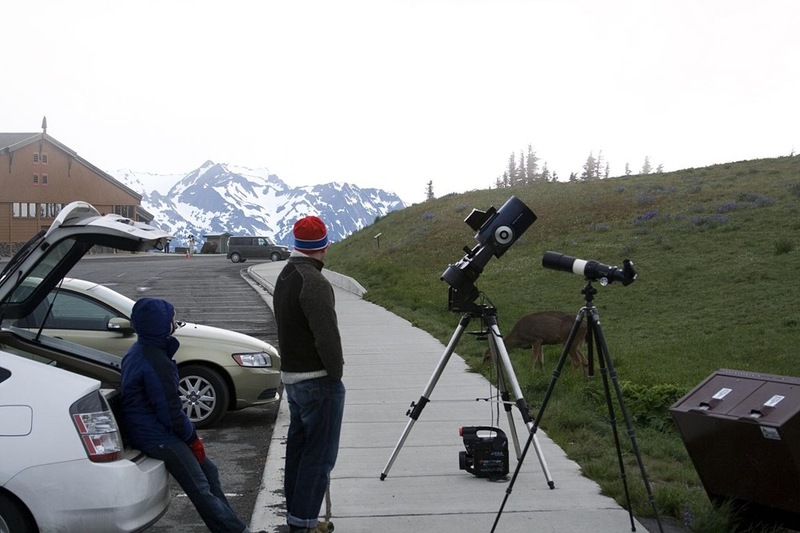 That’s Diann leaning on the Prius, me standing on the sidewalk, and a black-tailed deer just beyond my telescope. 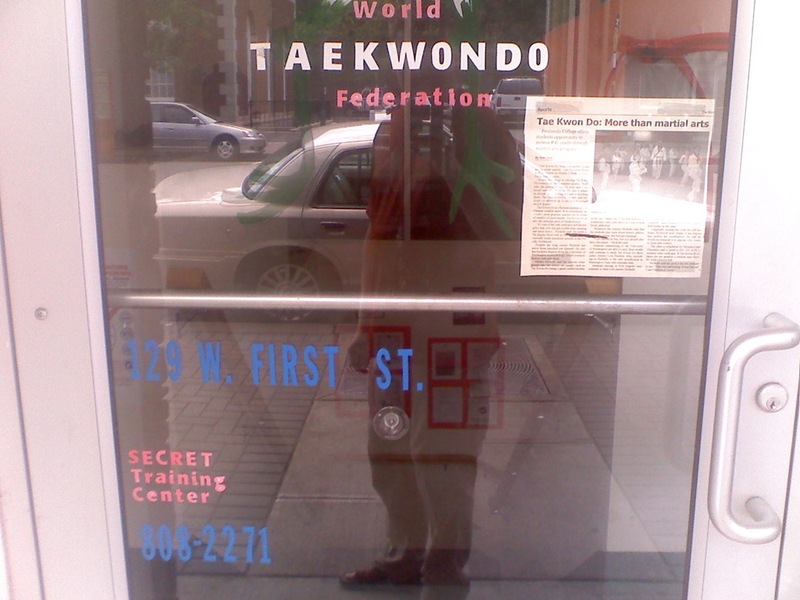 See if you can spot the humorous bit on the door to the Martial Arts training center. This weekend had some more clear skies, and I had been warned well in advance. I cleared the Saturday morning calendar, and packed up back out to Rattlesnake Lake with a bunch of the SAS guys for some viewing. The seeing and transparency were phenomenal – a very stable atmosphere with not much crud in the air. This makes astronomers happy! The moon didn’t come up until 2am, so we had great darkness for a few hours. Sadly, a bunch of the things I wanted to knock off my list were hiding behind a large hill to the southeast – I need to find a viewing site that has better horizons in that direction. Favorite item of the night goes to M11. I had just gotten done complaining to a few people how boring I thought open clusters were, and then I centered on M11. Wow – it’s totally opened my eyes to how cool some open clusters can be. This one’s definitely a new thing on my hit list of things to look at again. Most disappointing thing: M80 – a tiny globular. Most pleasing view: getting M59, M60, and NGC4638 in the same field of view. 67 Messier objects completed since November 2007. Not bad – 3 more to go before I can file for the initial Astronomical League Messier certificate. 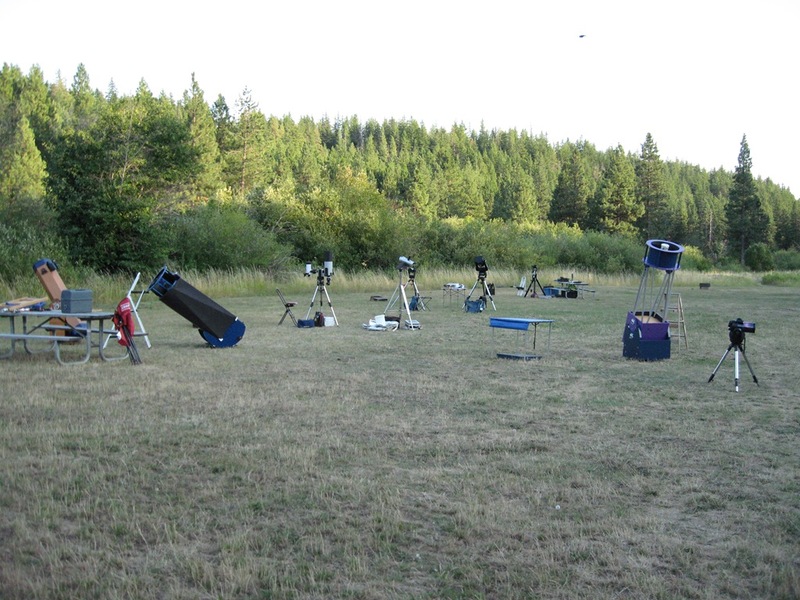 I’ll be at the Olympic Star Party on Hurricane Ridge this weekend, so I hope to knock out a bunch of the eastern ones that keep evading me at Rattlesnake. Ride 1 on the bike: from home, to my office, to REI (to buy some bike clothes), and back home. Around 15.9 miles. Ride 2 on the bike: commute from home to my office, and back again. Around 11.5 miles. Ride 3 on the bike: from home, up the Lake Sammamish Trail, and up to Red Hook brewery. A beer and a burger, and then back home. 20.9 miles. Ride 4 on the bike (today): commute from home to my office. Will go back home tonight. Granted, I’m not in the greatest shape now, but the first 3.4 miles of that ride took me around 15 minutes this morning. Climbing that !#@%$ hill for the next 1.5 miles took me another 20 minutes. Stupid hill. Stumbled across veloroutes.org, which is a great mashup of Google Maps and some elevation data to give you distance and elevation maps (just like the one above). Oh, and speaking of !#@%$, I was saddened to see that George Carlin passed away this weekend. Anyhow, that’s all. More later. Posted bymarius June 23, 2008 Posted inUncategorizedTags: astronomy, bike8 Comments on Where’s Marius been?